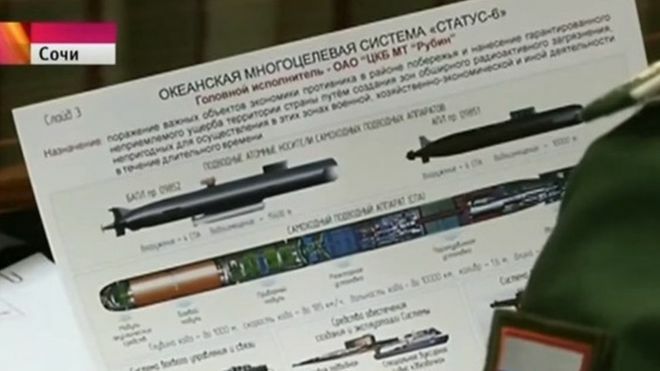 Russia’s plan to create a giant nuclear torpedo capable of wiping out a costal city could be farther along than just graphics on a briefing slide and gives purpose to a mysterious nuclear submarine, currently under construction. Last month the Kremlin leaked its plan to develop the new Status-6 (or Kanyon) strategic weapon under the guise of a state controlled television feed accidentally catching a glimpse of the program overview. The torpedo, according to the leaked details, is designed to “destroy important economic installations of the enemy in coastal areas and cause guaranteed devastating damage to the country’s territory by creating wide areas of radioactive contamination, rendering them unusable for military, economic or other activity for a long time,” according to a translation of the document by the BBC. According to the leaked images, the Status-6 maybe as large as 80 feet long and powered by a nuclear reactor to give the torpedo a range of thousands of miles to deploy a warhead of up to 100 megatons. The existence of the weapon also presents the best explanation yet to a mysterious submarine laid done last year in Russia’s Sevmash shipyard in Severodvinsk. The Project 09851 nuclear submarine Khabarovsk has some similarities its new Borei-class of ballistic missile submarines but shorter and absent any ballistic missiles tubes. Instead, according to study of the imagery by naval analyst H I Sutton, Khabarovsk is being custom built to field up to six of the Status-6 torpedoes. Sutton determined the Khabarovsk design follows on a similar configuration found on the test submarine Sarov launched in 2007 that could also accommodate a torpedo the size of Status-6. “The leaked graphic strongly hints toward the Khabarovsk having two side-by-side hulls in the bow,” wrote Sutton. The configuration would create a first-of-its-kind strategic weapons platform purpose built to sidestep the growing effectiveness of American ballistic missile defense (BMD) systems. While little about the Status-6 or the purpose Khabarovsk can be proved definitively at the moment — the attention the disclosure has generated does benefit the Russian military-industrial complex. “Ship, submarine and weapons exports remain a major source of income for the Russian economy and news of new advanced Russian mystery weapons and submarines, regardless of whether they ever enter production or not, helps enhance their reputation on the international arms market, and also contributes to a growing pride the Russian people feel regarding their defense forces,” Eric Wertheim — naval analyst and author of U.S. Naval Institute’s Combat Fleets of the World — told USNI News on Thursday. Still, the emergence of the weapon has registered official concern from U.S. officials. “We are concerned about [Status-6] as a threat to the United States, but if it turns into a system that is widely put into operational deployment,” Rose Gottemoeller, undersecretary of state for arms control and international security, told the House on Tuesday.